It's funny because just earlier this week I was sitting on the couch in the morning, shivering, listening to scattered rain drops hit the window, thinking that in a few short days, I will be sitting in the same spot, sweating, listening to fireworks explode outside my front door. The heat wave was coming. Now is that time of summer. The time when it's 80 degrees at ten at night; the little fan, blowing with all its might, cuts a minuscule swath through the heat. I've lived through days like this before. Having spent many years working outside, in the dust, and the heat, with horses, the setting sun brought a welcome cool to the 100+ days. Nights like tonight were cherished as the animals and I could breathe a sigh of relief after being brutalized by sun all day. Yet, despite my memories of endless hot summers. Despite sitting here now, 2230 and sticky from sweat, I could not place myself here five days ago. I knew the heat wave would happen, but on that shivery Monday morning, I couldn't feel being shoeless, in a tank-top, and still too hot. And sitting here now, even though I remember that I shivered on Monday, I cannot feel it, put myself there. It is a memory that, for now, only exists in my mind. And that's a blessing I suppose, how the mind remembers but the feeling subsides. For now I will revel in this moment, a hot, late night. In two days it will be different, as the heat wave will have subsided, gone dormant for a time, but remembered. 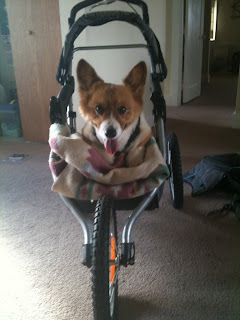 Yes indeed, that is my dog in a jogging stroller. Having a paralyzed dog and pushing him around in a stroller takes a certain type of moxie (or insanity), as most people think something along the lines of she doesn't have kids, so this must be some sort of psychological fulfillment of that lack. Other people just think my dog is lazy. So I set 'em straight. The dog can't walk. For the most part, I adjust to Lewis's paralysis as it comes. He can't do much. I have to carry him from here to there. He rides in a stroller. But he seems happy and participatory enough. He still drags himself around pretty fast in the morning, biting my calves and spinning in circles, something he's done his whole life. Even so, despite mine and his adaptive qualities, there are days . . .
One particular day of late, as I was pushing Lewis through the park in his stroller, I got overtaken by the weight of his condition and his constant needs. Totally consumed, I was startled when a little piece of cotton brushed by my face. Looking up, I noted the warm breeze showered us with cotton fluff from the cottonwood trees. I have to say, it's pretty hard to be morose when you find yourself encompassed in floating cotton, standing in a field of grass dancing in the warm spring breeze, brushed golden by the setting sun. Yes, it is easier to have a fully ambulatory dog, but I see that God still smiles on us. I am thankful to live in one of the most rugged and beautiful places in the world. Surrounded by the ever-changing face of nature, I am reminded that nothing stays the same, yet everything is taken care of, including Lewis and me. And so we press on. My rental house has this quaint little closet in which resides the smallest washer and dryer set ever manufactured. While forcing my t-shirt and one sock into the washer, I noticed a movement to my left. Gliding deftly down from the ceiling was a little spider. When he got to about four feet from the floor, he ceased his descent and proceeded to simply hang there. Being, in general, a friend to all things living, I shut the closet, assuming the spider would eventually climb his way back up his web and move to another location. Around midday, I was putting the clothes from the washer into the dryer and found the spider still dangling in the same place he was before. Wanting to know if this was normal arachnid behavior, I texted a friend to get her opinion. She decided the spider just wanted to swing and suggested I give him a push. Having none of playground shenanigans, the spider splayed his legs and acted rather startled as he swung back and forth. Nope, he must not want to be pushed, I decided. Shortly after, I completely forgot there was a spider hanging in my laundry closet, and I nearly smashed my face into him while organizing my recycling bags in the closet. So there he is, at this very moment, in all his glory. If he's still hanging like that tomorrow, I will relocate him outside. While it's be great having him hanging there and all, enough bizarre spider behavior is enough. I have lived in my small town for going on four years now, and it only just occurred to me two weeks ago that I live in the mountains. Never having lived in the mountains before, my eyes have been opened to shocking concepts, namely that winter lasts a lot longer. Despite this somewhat disappointing fact, spring does eventually even come to the mountains, and along with spring comes little birds. I have noticed that little birds really enjoy being clean. Now, one must bear in mind that my small town does have a lovely, small river running through it. This small river is even replete with little shallow areas of slow moving water; a veritable bathing bird's paradise. But is this where the birds choose to take their daily dip? No. Rather they choose my dog's water dish sitting in the backyard. From sunup to sundown, it is not uncommon for me to see large groups of little birds communing around my dog's water dish. They sit on the edge. They jump in and fluff their feathers through the water. They poop in it. . . And it's only eight inches in diameter. My dog could be sitting right there, next to the dish, and some brazen bird is flitting around in his dish, bathing itself. Sometimes Lewis is too close to the dish and the birds get antsy, jumping around him, waiting for him to move so they can dive in. How do these birds even know his dish is there? When they have an entire body of water to douse themselves with, what draws them to two inches of water in an eight inch dish in a dandelion-filled yard? Maybe the answer will come to me, in about four years . . . The unexpected. It is a concept I have been pondering lately, and one illustrated well by a group of marsh-dwelling frogs. On my walks at dusk, I pass what would seem to be a large group of frogs, croaking merrily away amidst the grasses of a horse pasture. At first listen, one would think the group consists of hundreds of frogs. Wanting to witness first-hand the conglomeration of amphibians, I tiptoed stealthily their way the other night. Pointing my flashlight toward the croakers, I expected to see many little eyes and nose holes peeking up through the grasses. Alas, I saw none. No movement, no eyes, no bulging throat skin. I stepped closer, shone my flashlight right where the sound was coming from. Once again, nothing. One step closer and all croaking ceased completely. There was no movement. No frogs ducked under the shallow water. Still I could see nothing. What appeared to be plain was in fact hidden. Unexpected. This morning, I expected my day to go a certain way, but I can tell you that everything that transpired, including the gorilla-suit wearing woman mooning a couple of police officers (no joke! ), was unexpected. My response? Great day! I can't wait for what happens next! Great concept, very ethereal, but hard to explain in practical terms. Despite being able to intellectualize a lot of things, I have a hard time really grasping something until I have had an experience with it in some way. House building has taught me and continues to teach me many things, and one of these lessons is about faith. I think I would be well justified if over a year ago when my brother Lee said, "Why don't you build your own house? ", I just said right back in return, "No way man! Are you crazy?!" Instead I thought, well, if he thinks we can do it, we must be able to do it. Despite the logistical shortcomings of two people, one being a smallish-framed female with zero construction experience, building an entire house by themselves, I doggedly plow forward in this venture because I believe we can do it. And I believe we can do it because Lee, a person well versed in the construction world, says we can do it. On a couple of occasions, when he is suffering from a myriad of aches and pains, Lee has asked, "Do you think this is more than just the two of us can handle?" And I will tell you, in those moments, my faith completely waivers. No longer am I happily plowing forward through a daunting task, trusting the leadership of my brother. Instead I start thinking about the many tasks before us, all of which I know nothing about, (plus lifting more heavy stuff!) and I feel despair. But then I shake it off and declare, "No! I don't think it is more than just the two of us can handle! Because you said we could do it!" And we both shake it off and carry on. Now that's faith.